I wasn't going to write one, but my team mate wants me to write up a report... So here we go. Firstly, I'm on the Colorado State University Rams cycling team and I'll start with the beginning, this may be a bit long, so bear with me. The deal was, we would meet at a parking lot and load up all 26 of us into two 12 passenger vans, a subaru, and a truck with a trailer. We loaded the bikes, got everything ready and was on the road from Fort Collins to Durango, Colorado (it took about an hour and a half to load up everything, so I went and got a late lunch with some team mates). As it was, I forgot to bring a laptop or a book, so we ended up just talking and bsing in the van on the trip down. We get to a little Mexican place about 90 minutes out (the drive is 8 hours or so) and have dinner. For the record, Mexican night before the race is not a great idea. The other van got a ticket for speeding on the way down the pass, so they were a bit late, but we all ate and got to the hotels around 11. Everyone got rooms in a motel place, couple people slept on the floor but we made due. Got to sleep at 12, waking up at 6 the next morning. The night before we went to the store and got some breakfast (honey nut cherios, milk and some plastic bowls) ate, changed, and drove to the race. The first event of the day was a TTT going off at 8 am, so we left at 6:45, got to the course at 7, registered, numbered, bathroomed, and warmed up-ish. The course was a rolling 30k TT straight out 15k and straight back. I got a pretty poor warm-up of about 15 minutes, not nearly long enough, but we had to go. My team (Men's C) left at 8:00 exactly, we were the first team out, so we had to set the bar. I got about 1/2 way before I had to drop off, leaving the other three to finish. The third person to cross the line stops the clock, so it was going well. For whatever reason, they moved the finish line about 50 yards closer, so everyone blew through the finish and kept on going for a while, but no matter. We won our TTT by about a minute while the Men's B's won by like 2 and the Women's B, which had two riders, only lost by 15 seconds to a Fort Lewis team of 4 I believe. Good start to the day. The Men's B's had by far the worst race, rain, snow, hail, you name it... All that was missing was a tornadoe or a tidal wave to make it complete. Two of my team members went off the front with a Fort Lewis rider and stayed away the whole race. Took turns pulling and attacking in the terrible weather. I'm sure my buddy will post here and describe what happened in more detail. I had ridden back to the hotel and got Wendy's and only saw the last few laps. Anyhow, these guys are amazingly strong, road away both days and had incredible races. 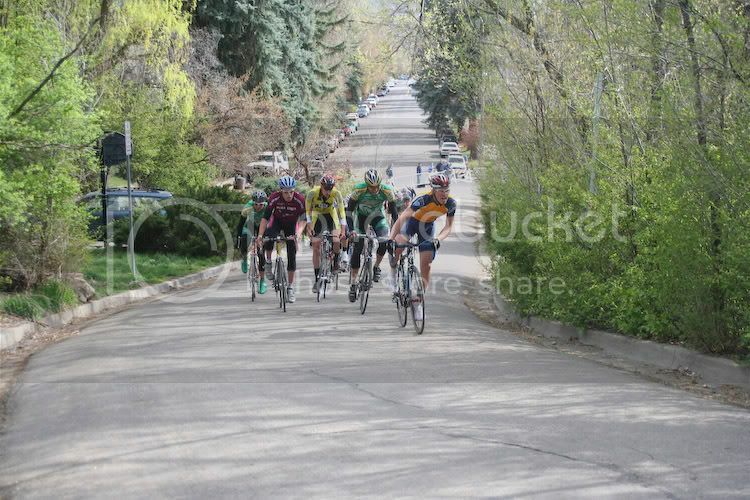 The Fort Lewis guy apparently wasn't very happy at the end of the weekend, they attacked him again and again until finally one got away to win the Crit. In the Men's A race, a CU rider put his hands up way early as he was about to finish in first and our A rider was seriously about 2 inches from taking the win from him. That would have been pretty cool, but almost. After all the races we went to a team members house for dinner, hung out, rested, went back to the hotel and slept. Now, the Road Race was around the Fort Lewis campus, with they said about 1,000 feet vertical per lap and on the back side there was a construction site we had to ride through, dirt, gravel and rocks. Fun. Anyhow, the race started at 8:06 Sunday morning for us, after the Women's A's and B's started. The first bit of the lap was a false flat and went pretty easy. Didn't have any trouble staying with the pack, then on the downhill it picked up. There was another Fort Lewis rider that kept trying to take my wheel, but for once I held my ground and wouldn't let him have it. Once the downhill started, I was behind the wheel of my last team mate and there was a decent gap behind us. I sat up, slowed down, and basically sat every corner and caused a bigger break to grow and split the field in half. About 12 riders including the three other team mates, got about 15 seconds by the time they got to the hill, while I was back still splitting and slowing the chase. I got dropped a bit on the fast decent, caught my group on the hill, and formed a "chase" of 7 people trying to catch the first half of the pack. We rotated a bit, when I got to the front I would sit up, get yelled at, and all those fun things. Basically, I just slowed the chase so they couldn't catch the break. Rode the rest of the race like that, ended up 14th out of 29 starters, and found out that my team member who won yesterday also took the win today. During the last lap one of my other team mates flatted, so I pulled him up the hill and got him up a ways and he got 12th. Pretty good overall. I don't think I would have been in contention for a win anyway, so I got to do some work and it was great. In the B's race the same two who were in yesterday broke away today with the same Fort Lewis guy. They attacked him all day until he broke on the hill and rode away to win. The guy who won yesterday got 2nd, and the other guy got first. Pretty good. The car ride home was pretty uneventful, we were all tired and sore. Ate dinner at some cafe place and just enjoyed how well we did. Overall, we had a excellent weekend, winning 7 out of the 15 races, and getting a podium on all but 3 I believe. We came, we saw, we conquered at Fort Lewis. Edit: It does NOT refer to Barcelona, I hate them. Very happy L'pool knocked them out this year. Your name no longer confuses me. looking forward to the scousers knocking out chelsea. Thanks for writing that up I was far too lazy. But you've inspired me, so I'll fill in some details. First off, Barca had his best weekend so far this year, really stepped up and was doing excellent work for the rest of the team. CSU's C and B squads are both very strong (both swept the whole weekend) but they wouldn't be what they are without the everyone racing as a team. I'm one of the B guys referred to. For a little background, I race semi-pro on a mountain bike but this is my full road racing season. I'm still learning a lot. At first it was frustrating because I knew I was strong, just stupid. But things finally came together this weekend. We had 2 teams for the TTT, I was in the first team that won by over 2 minutes. We've been doing a lot of TTT practice lately and it definitely payed off, everything was smooth and fast over a tough, rolling course. Not many more details about that TTT... just 44 minutes of suffering, focusing on the wheel in front and taking good hard pulls. The RR was a 6ish mile course with 1000 feet of climbing per lap, and a 300m dirt road section in the middle of the downhill. The start was at the highest point on the course, so we went down a ways first before climbing back up to the start. Not sure of the exact percentages on the climb, but the inside of the switchbacks were definitely close to 20%. First lap we had 2 guys take a flier off the line, and got rid of about 20% of the pack. This was the goal, since those guys are sketchy anyway. Hit the hill for the first time in 3rd wheel. All the guys we expected to be up front were there - myself, the same teammate fromt he crit, the same FLC guy from the crit, a strong CU rider, and one of the FLC guy's teammates. We hit the first hill pretty hard and dropped the lead group to about 10 guys, 4 of which were from CSU. Things were looking good second lap, same thing. The FLC guys' teammate set a hard tempo at the front an knocked off one of the CU guys - down to 9. All our guys were still on. Fast forward to lap 3. Group is down to me, crit winning teammate, FLC guy, CU guy, and 2 other CSU guys. So, group of 6, 4 of which are CSU. The 2 other CSU guys lost it on the climb, but chased back on by the end of the lap, just before we hit the climb on lap 4. One of them came straight through and attacked, forcing FLC guy and CU guy to counter. CU guy faded, 2 other CSU guys faded, so it was down to the same 3 guys as the crit. 5th lap, all the way around, hit the climb at the end of the lap. FLC guy is TIRED, we can tell. 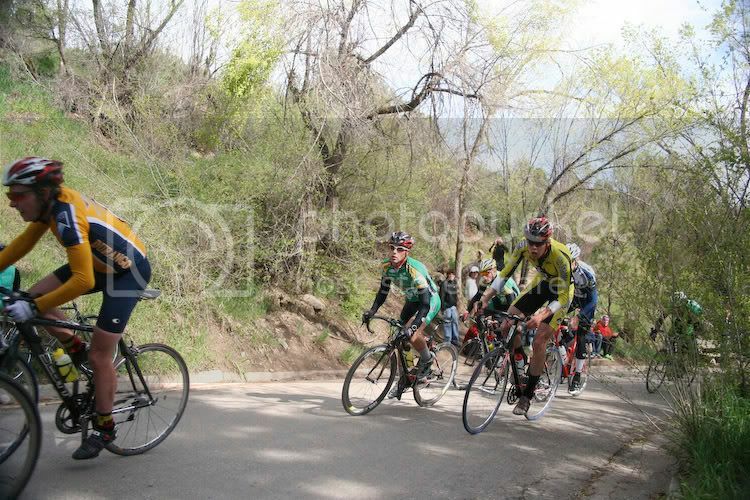 Around the first switchback I hit the gas, teammate comes with me, FLC guy hangs on for dear life. Second switchback kicks up, teammate pulls through, I follow, FLC guy falters. I see him hurting and say "go" to my teammate. We accelerate again - FLC guy pops off. Finish up the climb together, with a 500 meter gap on the FLC guy. So now it's just the two of us with a lap to go. Teammate won saturday, so he helps me out. He pulls most of the way around the last lap, our lead increases on everyone. We come up the last climb together, all smiles. We pop up the last steep grade before the finish and put our hands up. He pushes me across the line to make sure I get the win. We should probably move up to A's, but next weekend is regionals so we can't. Oh well. I'll just have to wait until mtb season where I actually get to go to nationals We got a few yells of "sandbagger" at the end because of what we did the day before too, but there's not much we can do. Neither of us had much experience road racing before this season so going straight into A's would have been suicidal. There's always next year. Last edited by ZeCanon; 04-24-07 at 06:41 PM. Well, at least we got the Carling Cup. Well, at least we have home kits whose sponsor logos won't stay on.